Call out these questions in front of the group and have fun with the answers. Think of a word that rhymes with “ May” for each line of this poem. The first is something that a horse eats. To do the second, stay out of the street. The third we do the last thing at night. The fourth is a mixture of black and white. The next is something that rides on the snow. The sixth is were we sometimes go. The seventh you get for work you have done. The eight is something that comes from the sun . The ninth is the noise a donkey makes. The tenth is used to carry cakes. The 11th is turned on a potter’s wheel. The 12th is the opposite of night. Answers: 1) Hay, 2) Play, 3) Pray, 4) Gray, 5) Sleigh, 6) Away, 7)Pay, 8) Ray, 9) Bray, 10)Tray, 11)Clay, 12) Day. Divide the audience into four parts. Assign each part a word and a response. Tell them that when you say their word they are to respond as indicated. Practice as you make assignments. One day out GARDENER went out to plant his garden. The GARDENER chose to plant his plot with many vegetables including CUCUMBERS, TOMATOES, and ONIONS. The GARDENER took some seeds and planted first a row of CUCUMBERS, then a row of ONIONS, then a row of TOMATOES. The GARDENER then stood back to watch his garden grow. Soon the CUCUMBERS, ONIONS, and TOMATOES had sprouted. The CUCUMBERS fell in love with the TOMATOES but the ONIONS stood between them. It looked as though this budding romance would never be, because the CUCUMBER were in one row and the TOMATOES were in another and the ONIONS were coming up between the two. The CUCUMBERS grew to be big and tall, and the TOMATOES grew to be plump and sweet, but the ONIONS still separated them. Alas all is not lost, one day, later in the season, our GARDENER went out to his garden and picked the TOMATOES,CUCUMBERS and ONIONS and the GARDENER made a great salad. In this salad he placed the CUCUMBERS, the TOMATOES, and the ONIONS. His beloved TOMATOES at last placed the CUCUMBER, while the ONION had to stand aside. That is, until the GARDENER ate his salad. Needs: You will need a fairly straight branch, about 10 to 12 inches long, with a clump of small leaves at the end. all leaves except the small clump at the end). You should be able to "palm" this clump of leaves in your hand. Keep them palmed until the surprise at the end of the play. Now you are ready to begin . raise stick up, nod yes, and with a "casting" movement "sow the seed." Lower stick to your side, keeping leaves carefully palmed. Hold up free hand, palm up , to represent the path. Bring up stick and "flutter" it through the air, swoop it down to pick at the "seeds" in your palm. Lower stick to your side. Make a fist of your free hand and slowly push stick up through fist. Move stick to a horizontal position and then lower it to your side. Hold up free hand with fingers curled. Push stick up through curled fingers. 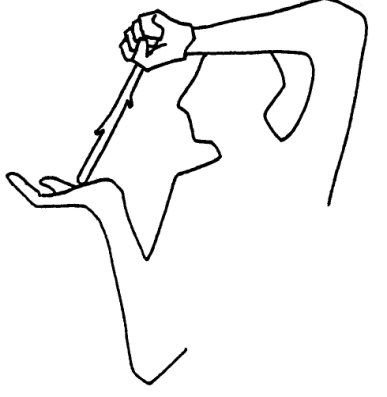 Squeeze fingers around stick and move stick to horizontal position. Lower stick to side. Bring up free hand and gesture out to audience with a sweeping motion while your lowered hand is switching the stick so that when you bring up your hand, the stick will be protruding from the bottom of your fist. As you bring your lowered hand up, bring your free hand down to grasp the stick and push it up to reveal the clump of leaves you had palmed. It's a neat surprise ending to the parable. It will always amaze the children, and after a lot of practice you will also be able to amaze some adults. By itself, the stick is just a stick. When you walk it, it becomes the sower. When you fly it, it becomes a bird. When you push it up through the rocks and weeds, it becomes a plant. Meaningful movement is most important to create the illusion of life. CLIMB: (Make climbing motion) Ugh, ugh! You’ve all the song about the Itsy Bitsy SPIDER going up the water SPOUT, right? Well, tonight we are going to hear the Itsy Bitsy SPIDER’s side of the story. The SUN came out and it dried up all the RAIN. “All I need is a little perseverance, a little determination and lot more dependable weather reports,” thought the Itsy Bitsy SPIDER. Then, he took off, CLIMBing up the SPOUT again. One small step for SPIDERs, one giant leap for arachnids. Drats, is that another RAIN cloud again? Oh, NO! The Itsy Bitsy SPIDER is down the SPOUT again! Is this Itsy Bitsy SPIDER a quitter? No! The SUN is out again. This SPIDER is making his big move. The SPIDER is CLIMBing to victory! This SPIDER is reaching for new heights, and not looking back! Just then, another RAIN storm came along and WASHed the SPIDER out! This SPIDER should move to a drier climate! Now our SPIDER didn’t give up. He picked himself up and said, “All right! This is it! NO MORE MR. NICE GUY! This time I’m going all the way to the top of this water SPOUT! The RAIN won’t WASH me out. I don’t care if the SUN is blazing! This time there’ll be no stopping me! This time ... I’m taking an ELEVATOR! Divide the audience into six parts. Assign each part a word and a response. Tell them that when you say their word they are to respond as indicated. Practice as you make assignments. The next day dawned clear and warm and the CUB SCOUTS and their parents and leaders arrived. The TREES rustled, the RABBIT trembled, the SNAKE hid , and the SQUIRREL jumped to the highest branch and lay there as quiet as he could. Then they all saw an amazing thing. The CUB SCOUTS started picking up all the trash and putting it in big picnic bags. Then they got out food, ate and hiked down to the creek where they waded until their feet were blue. Someone spotted the SQUIRREL, they pointed at him, told the boys what he ate, and some of the CUB SCOUTS gathered a pile of acorns and left it under the tree! The SNAKE was hiding beside her favorite log. She looked pretty much like one of the old branches, but one of the sharp eyed CUB SCOUTS spotted her. They caught her, looked her over carefully and then put her back down by the log. The SNAKE couldn’t believe that she was free. That evening the SPARROWS returned to see how the day had gone. They couldn’t believe what a difference the meadow looked with all the trash gone. T he RABBIT told them, “The CUB SCOUTS picked up all the trash, and left some apple cores and sandwich edges behind, which were delicious. The TREES and animals were glad the CUB SCOUTS had come.